Buyers of today and major purchasers of tomorrow want to know where suppliers acquire their food, how it is traced along the supply chain, and the methods used to ensure food safety. When you source commodities and products from Red River, you gain the confidence of knowing there will never be a question around quality and long-term sustainability of your product line. A successful business model means a commitment to responsible business practices that result in a sustainable supply chain. 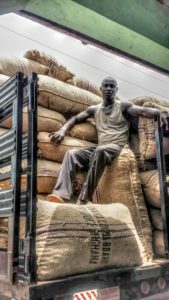 And a truly efficient supply chain requires promoting human rights, protecting the environment, and supporting ethical business conduct. At the core of Red River Foods is “CSR,” or corporate social responsibility. That is why we have created our own 501c3 Nonprofit Organization to support and manage our development work around the world. As a company, we invest with dollars and people-power in causes that are important in the regions where we operate. We help local farmers improve their processes, invest in environmental efforts that improve ecosystems, and support local programs that serve the needs of families. Beekeeping – We provide farmers with beekeeping equipment and training in order to increase cashew yields through pollination. Not only does this grow farmer incomes through increased cashews, but farmers are able to sell the resulting honey and wax as a supplementary source of ancillary income. Pruning and Thinning – To promote safety and proper harvesting techniques, we provide chainsaws (and training), protective clothing, and pruning education. By correctly spacing cashew trees and pruning their branches, cashew yields dramatically increase. Seedlings – We give back what we buy: Over the years, we have provided thousands of seedlings to dozens of farmers in every African community where Red River operates. 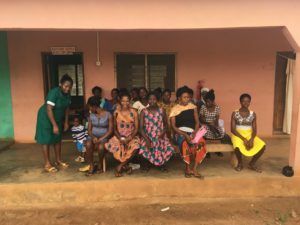 Access to maternity care is a major obstacle for rural residents in many parts of Ghana. Unfortunately, maternal mortality remains high in this West African country; for every 100,000 women in labor, 350 die while giving birth. While free maternal care and other government programs are achieving positive results in some areas of the country, the Brong Ahafo region, where Red River sources cashews, continues to lack adequate health care facilities, emergency units, and trained personnel. To help generate funds necessary to build a maternity ward in Kokoa that allows women to receive timely care and prevent overcrowding, Red River agreed to buy raw cashew nuts from the community at the existing market price plus a premium to help fund the ward. 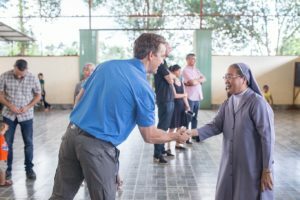 The effort is a partnership among Red River, Costco, the Peace Corps, and the Kokoa community. In addition to the ward, Red River is developing a long-term, mutually beneficial relationship with the Kokoa people where we pay a premium for their cashews to help residents continue developing the community. Brazil nuts are one of the biggest actors aiding in the preservation of the Amazon rainforest and development of Amazonian communities. Rainforests are worlds governed by complex ecological interdependencies, meaning disruption of one link will result in a devastating chain reaction. 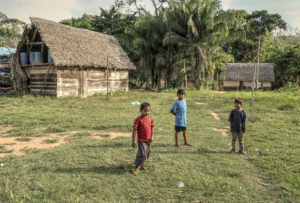 Harvesting brazil nuts requires an interdependency of a rodent called the agoutis, orchids, and bees (read all about it on our blog) – plus, many families in Brazil rely on the nut harvest as a stable source of income. The Brazil nut trade is a large source of economic support for the governments and communities of producing countries, so there is great incentive to keep the Amazon rainforest healthy – no rainforest, no brazil nuts. For these reasons, we partner with respected non-governmental organizations in their attempt to fight deforestation to protect both the trees and the communities that rely on their harvests. To learn more about the fascinating story of the Brazil nut, visit our story section. By purchasing Brazil nuts, you're directly supporting rainforest preservation. Less than five miles from our cashew processing facility in the Vietnamese city of Pleiku is Thien An, a boarding school and orphanage that serves as home to more than 100 disadvantaged children. Thien An’s mission is to provide a stable, caring environment for the children. Through the aid of dedicated sponsors, the kids receive free housing, food, clothes and lessons. Currently we sponsor more than a dozen children at Thien An. We believe it’s just as important to be involved in community development domestically as it is internationally. We take time every month to give back to our local community in Richmond, VA (where we are headquartered) through a variety of volunteer activities. W enjoy getting our hands dirty at some of our local nonprofit farms working to provide individuals living in food desserts with fresh, free local produce. 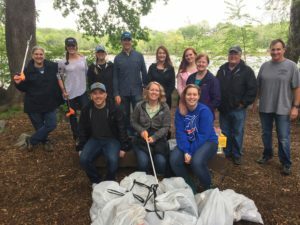 Other efforts include trash pickups along the James River and surrounding areas. We are always looking for other ways to get involved in our local community- if you’re an organization that needs some hard-working volunteers, please let us know!